Remove the stalk of the lettuce by chopping off the bottom third, being careful not to tear any leaves. Turn the trimmed lettuce upside down, place it in the centre of a mixing bowl and pour over hot water very briefly before submerging it in ice-cold water for at least a minute. (This process will help you separate the leaves from each other without much effort.) Separate and drain the individual leaves, trimming them for presentation if needed, and place in the fridge to cool. Butterfly the prawns, cutting a line from underneath the head of the prawn to the tip of the tail using a sharp knife and opening up the prawn fully. Finely dice your red pepper, finely slice your spring onions and chop your garlic. Mix your sauce and dressing ingredients together in separate bowls or small ramekins. 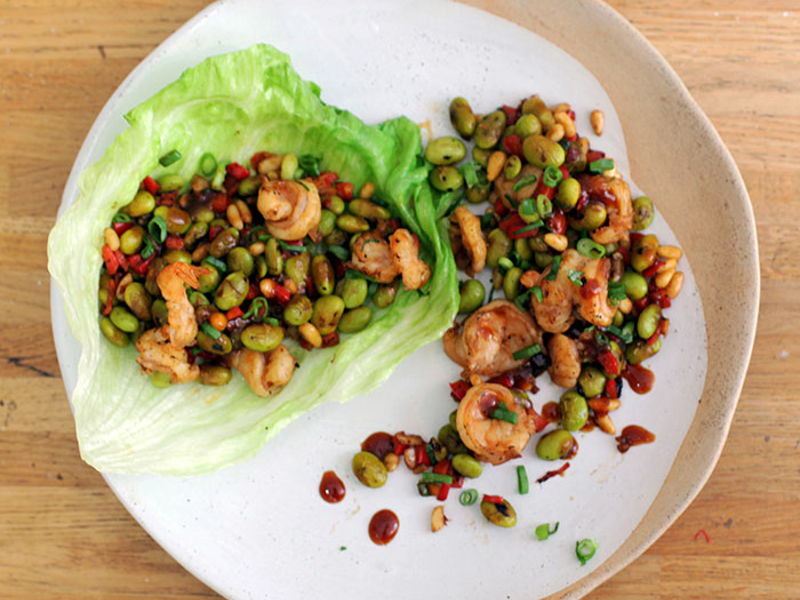 BUILD YOUR WOK CLOCK: place your butterflied prawns at 12 o’clock, then arrange the red pepper, edamame beans, garlic, pine nuts, spring onion and sauce bowl clockwise around your plate. Heat the vegetable oil in a wok over a high heat until smoking-hot. Add the prawns and stir-fry for 30 seconds, then add the red pepper, edamame beans and garlic and continue to stir-fry for 1 minute, keeping the heat high. Add the pine nuts and stir-fry for 30 seconds, then pour over the sauce and continue to stir-fry until the prawns are lightly golden brown on the outside. Sprinkle over the spring onion and transfer to a serving plate or bowl. Pile the lettuce leaves on a separate plate and serve with the dressing. Let everyone help themselves by filling a leaf with a spoonful of the prawn mixture, wrapping it into a bundle and dipping it into the dressing.